- Iceland 24 - Iceland Travel and Info Guide : Do I Need a 4x4 Rental Car in Iceland? When planning an Iceland road trip, one of the first and most important decisions you’ll have to make is what kind of vehicle to rent. Once you’ve decided between a car, campervan, or motorhome, you’ll need to make an even further distinction. If you’ve opted for a smaller vehicle, you need to figure out whether or not to go for the 4-wheel drive option. There are a couple of factors that go into if you choose 4WD or 2WD for your rental. Let’s go over the differences. 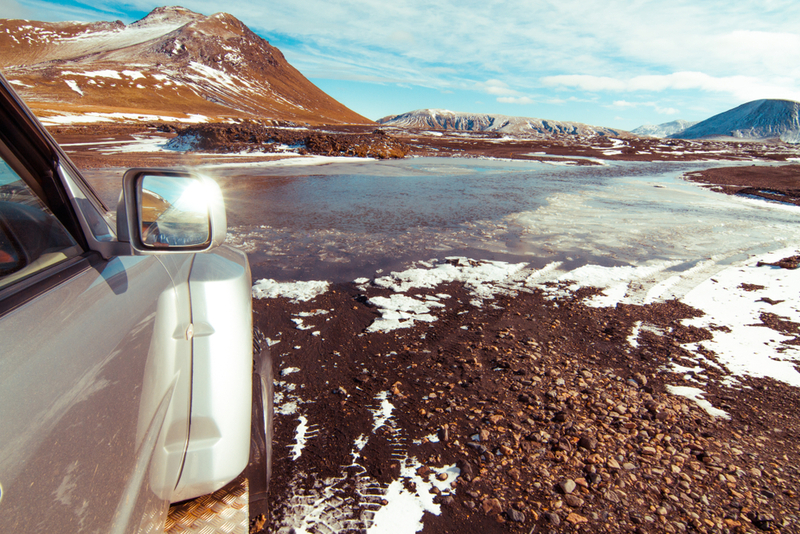 Keeping in mind where you want to drive and the time of year are the keys to answering whether or not you need a 4x4 rental car in Iceland. Do You Plan on Using F-Roads (Mountain Roads)? If the answer is yes, then you definitely a 4-wheel drive rental. The reason isn’t simply the rugged terrain, unpaved gravel roads, or the fact that you might be crossing shallow rivers. It’s actually illegal to drive on Icelandic roads without a 4x4 vehicle. That’s right, a 4WD is mandated by law. If you end up with only a 2WD car or campervan, you simply cannot access these roads. Your rental company will like put some sort of sticker on your windshield to remind you of this fact. You don’t want to break the law or risk getting stuck because you were driving an ill-equipped vehicle. F-Roads are found mostly inland, in the Icelandic Highlands. 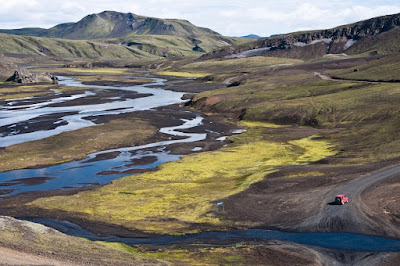 Think places like Landmannalaugar. There are also place like the Westfjords and other zones with either unpaved roads, rocky terrain, or both. F-Roads are simply mountain roads; the F stands for “fjall”, which means “mountain in Icelandic”. So F35, which leads to Gullfoss waterfall, is just “mountain road 35”. It’s quite simple. It’s important to note that Iceland’s F-Roads are not open all year. There’s a small window (June/July to late August) when conditions are safe to drive on these roads. The Iceland Road and Coastal Administration is in charge of opening dates each year. It changes depending on which F-Road you want to access and how things are looking safety-wise. So now that you’re an expert in mountain roads, let’s talk about another factor in 4x4 car rental in Iceland. Just like you want to have greater control over your vehicle when driving through Iceland’s hilly landscapes, you will want the same thing when driving in icy, snowy conditions. Wet, slick roads caused by rain, snow, sleet, hail, and other types of precipitation can make things a little trickier. Black ice is downright scary, and slush means you’ll need to go slowly and proceed with caution. I highly recommend getting a 4WD if you plan on driving in Iceland in the winter. It will be easier to maneuver your vehicle on the road and easier to regain control if heaven forbid you skid out or have some other driving emergency. Do Campervans Come With 4-Wheel Drive? Before you start seeing your Iceland campervan dreams go up in smoke, fear not. There are actually several campervan models like the Marco Polo and the VW California Camper that have 4WD. Hooray! They really did think of everything. So while you will need to drive carefully in the mountains with a camper (and don’t even think about fording a river à la Oregon Trail), it’s entirely possible to explore the Highlands with your camper. Whether or not you choose to rent a Jeep, SUV, car, or campervan with a 4-wheel drive is entirely up to you. 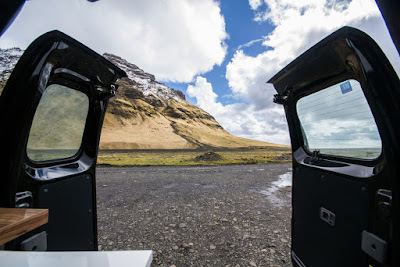 It all comes down to where you want your Iceland itinerary to take you and if you’re coming at a time of year when having a 4x4 is an advantage. The daily rental rate for a 4WD car might cost a little more than a 2WD, but it could be worth it in the end. If you’re simply driving around the Road in the summer, I recommend sticking with a 2-wheel drive vehicle.